This week I’m going to share with you 2 other techniques: dip dye color paper and painted color paper. Dip dye color paper: Involves dipping paper in a water mixture tinted with food colouring or paint to add color to the paper. Advantage – You can color the paper to any color of your heart’s desire. In the above example, I dip dyed white fine crepe into a mixture of food coloring (AmeriColor soft gel paste food color in Deep Pink) and water. Dip dying color also allows you to easily adjust the density of the color – if you want the color to be darker, add less water; if you want a lighter version of the color, just add more water. Like dip dye paper, you can do this ahead of time, and let it dry while you work on something else. Disadvantage – There is some trial and error involved in finding the perfect proportions/mixture to get the color you want. 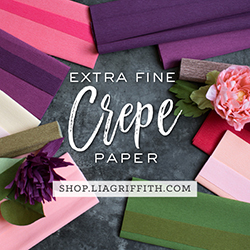 I would make the mixture and then dip a small strip of paper towel to get a sense of how dark/light the color would be if the white fine crepe paper was dipped into the mixture. I also found it was difficult to control even absorption of the color mixture. You can see from the photo below of the strips of Deep Pink dip dye color paper that the mixture was absorbed quite unevenly. On the far left was my first attempt; the color is dark and intense, but does not spread to the rest of the strip. In the middle are 2 strips of my 2nd attempt to spread the color around the strip more evenly. Finally, on the far right are 3 strips in my 3rd attempt. Painting color paper: Involves applying color directly onto the paper either after assembly (eg. painted color peony above) or prior to assembly. Advantage – Generally it is easier to control the darkness/lightness of the color and placement of color because you apply the color directly onto the petal. Disadvantage – Can be more time consuming and you’ll have to set up a painting area. I do find that I prefer to hand paint the petals prior to assembly. It ensures that the paper won’t wilt and/or change shape if you apply too much liquid to it. Also, it can be challenging to apply color evenly to the petals after assembly without disturbing the other petals surrounding it. Check out last week’s post where I talk about 2 other techniques of coloring your paper: dip dye paper and dip dye bleaching. I have also updated the post to include the proportions for the bleaching mixture. In my next post, I’ll show you some fantastic results I had with using AmeriColor soft gel paste food color in Royal Blue on some cupcake toppers.